With the release of the first Kingsman film back in early 2014, it seemed like a fresh beginning to an interesting throwback spy franchise. We had seen the likes of James Bond reach high levels of camp before but never had it had the electricity carried so thoroughly. With a larger cast and greater stakes the sequel looks to improve upon what came before yet unfortunately squanders its talent for retreading a story we have seen before. 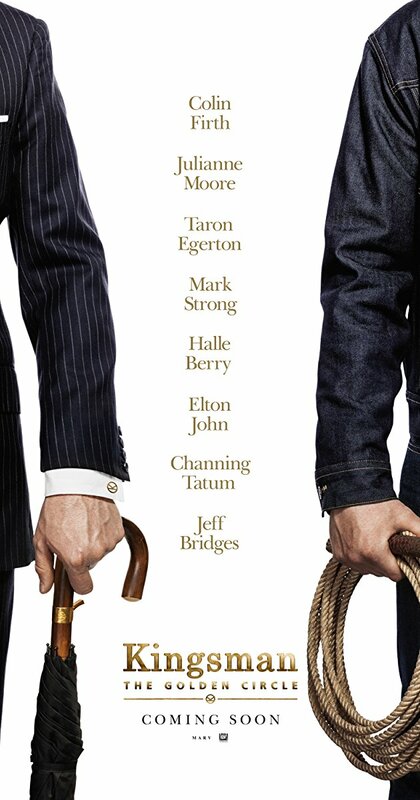 The British Secret Service Kingsman are tasked with uncovering a secret drug cartel that has led to the destruction and deaths of their entire unit, save Taron Egerton as the talented but young agent Eggsy and Mark Strong as the brains of the organization, Merlin. Together they must work with their American counterpart The Statesmen as more Roger Moore-style antics occur. Director Matthew Vaughn returns and once again shows that he can command sudden shifts in tone with ease as the film transitions from jokes to bloodbath back to a heart breaking stare of a sad puppy. As with the first film a the infusion of popular songs that add a heft to each action scene that helps them all flow together in a truly exciting way. The cinematographer George Richmond has crafted another great looking film that stitches its action and drama in beautifully crafted frames that is unfortunately undercut by a heavy use of CGI. This is where the problems of film begin to shine through the cracks. The movie feels inconsequential in its craft as the majority of scenes attempt to one-up the previous film by copy-pasting its formula while displaying a lack of originality when compared to the excellent set pieces Vaughn has shown to masterfully deliver. An overabundance of new characters and a happy-go-lucky reliance to kill any character finished servicing the plot creates an odd, almost mean handling of the characters that, while acted very well from the multitude of seasoned actors, lacks the charm and care dealt to them previously. It must also be mentioned that a certain plot point from the previous film is reintroduced to the world (this has been spoiled in every single trailer prior to the films release) that undoes and takes away from the first film almost affecting how one would potentially feel about that first film. A fun ride that works best if you try not to reason with it, the filmmakers have tarnished the first films excellent framework with a sequel that unfortunately plays it safe while never fully seemingly to realize the potential that it had.